As students prepare to open their A level results next month, Education Correspondent Kat Keogh looks at the chances the region’s sixth formers have of studying at a top university. For centuries, Oxbridge has been the seat of academic excellence, nurturing some of history’s greatest thinkers. It’s a reputation that has continued into the 21st century, if application figures are anything to go by. More than 17,000 people applied for an undergraduate place at Oxford for entry for the 2010 intake, up 12 per cent on the previous year, and in 2010, Cambridge unseated Harvard to top the league table of the world’s best universities according to QS World University Rankings. 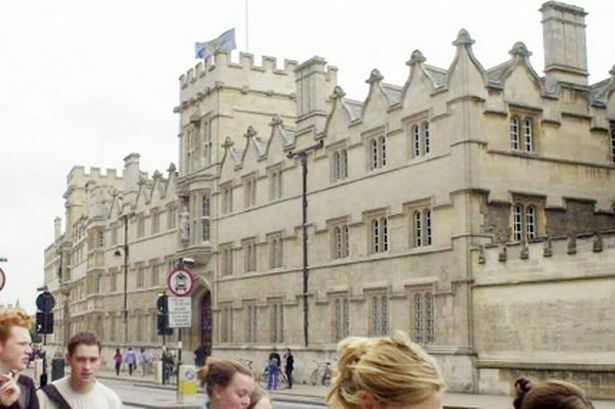 Yet a study into higher education has revealed that fewer than one per cent of West Midlands’ sixth form students are offered places to study at Oxford or Cambridge. The research, carried out by education charity Sutton Trust, shows that on average 0.6 per cent of the region’s sixth form students won places at the two elite institutions between 2007-09. Birmingham came top of the regional table, with some 1.4 per cent of students completing sixth form studies over the three years being offered a place, with Sandwell at the bottom of the local authority table with zero per cent. The report also revealed that just four schools and one college in the UK won more places at Oxbridge than the country’s 2,000 schools combined. Westminster School, Eton College, St Paul’s School in Barnes, London, and St Paul’s Girls School, Hammersmith, which are all private, and Hills Road Sixth Form College, Cambridge, a state school, produced a total of 946 out of 1,873 Oxbridge students from the UK. So with the report showing that state pupils in areas including Hammersmith and Fulham and Buckinghamshire are more than 50 times as likely to be offered a place than those in Sandwell, why do so few of the region’s students make it to Oxbridge? Aspiration levels at schools, in families and the wider communities can play a part, according to Lesley Kendall, who analysed the data on behalf of the Sutton Trust. She said: “In a lot of areas in England, the idea of higher education is still relatively new, so we must not take for granted that everyone will apply to university. “Looking at the figures, the West Midlands is pretty much on a par with other parts of the country in terms of acceptances to Oxbridge. The West Midlands does have very successful grammar and selective schools, and as a consequence comprehensive schools may not be as comprehensive as in other areas. “You do see a drop in the number of applications in the Midlands when you look at the top 30 most selective universities. "We deemed the top 30 universities in terms of being highly selective, which includes the University of Birmingham and Warwick. Just three of the region’s schools made it into the top 100 UK schools ranked by percentage of students who were accepted to Oxbridge over the three-year period, and all were selective schools. Heading up the list was King Edward VI High School for Girls (KEHS), with a 13 per cent acceptance rate, followed by King Edward’s School, Edgbaston, at 12.5 per cent and Rugby School at 11.6 per cent. But despite recording 31 acceptances over three years, KEHS principal Sarah Evans warned getting a place at Oxbridge “shouldn’t be the be all and end all” for bright students. “As a school we are not hung up on Oxbridge,” she said. “We are fortunate that in this country there are a number of hugely good universities and I don’t understand why the media insist on concentrating on Oxbridge. “What is far more important is finding the university that is suited to the right girl. For young people to hear that going anywhere but Oxford or Cambridge is somehow second best is very damaging indeed. KEHS will now be sharing the secrets of its success after becoming the only independent school in the country to be awarded teaching school status earlier this month. The programme will see 100 schools nationwide sharing ideas and best practice by heading up a partnership between a group of schools, and at least one university to train new staff and help schools train new entrants into the teaching profession. Ms Evans added it was “vital” highly-successful schools played a role in nurturing the talent of pupils outside their own classrooms. She added: “The thrust of the Sutton Trust report is that there are very bright children in comprehensives who ought to be getting into Oxbridge but are not doing so, but the fact remains that they are two small universities and not everybody who is bright can be accepted. “I’m passionate about working with other schools to help bright students realise their potential and that is why being awarded teaching school status will be a key step for us to do more. For example, we realised there was a shortage of maths teachers not just in the West Midlands but across the country, so we run after-school maths classes to help students from other schools. “Another thing to remember is that we offer means-tested, assisted bursaries for girls, so success is not just down to family status. As well as examining Oxbridge acceptance rates, the Sutton Trust also examined the individual schools’ admission numbers for the UK’s 30 most selective universities – including Oxbridge, the University of Birmingham and the University of Warwick. Table showing university placements from Birmingham schools. AC Academy; ADP Specialist art, design and performing arts college; COMP comprehensive; HE higher education instituation; IND independent school (includes independent sixth form colleges); SEL selective (grammar school); SFC Sixth form college; Sixth Form Centre a comprehensive school with an age range of 16-18; TC tertiary college; GFE general further education college. The report placed Hammersmith and Fulham top in the country with a 58.5 per cent acceptance rate, with Birmingham taking 12th place overall with 26.4 per cent of an average 3,803 pupils being offered a place at a top university. And with the Universities of Birmingham and Warwick on their doorstep, background shouldn’t be a barrier for bright students, according to Gail Rothnie, head of outreach at the University of Birmingham. Around a quarter of the university’s students are from the West Midlands, and Ms Rothnie manages a team of outreach officers whose work includes the Access to Birmingham (A2B) scheme, designed to help students from a disadvantaged area with little or no experience of higher education. The scheme, which awards scholarships worth £1,200 for each successful year of study, works with partner schools and colleges across the region to identify gifted students who possess the talent, but not the means to study at the university. To qualify for the programme, the parents of those who apply must have no experience of higher education, the main household income must not be over £42,600 and the main income earn cannot be in a professional occupation. Sixth formers hoping for a place on the scheme make two applications to the university, one through the standard UCAS application and a further A2B application. A successful A2B applicant will receive two offers from the University of Birmingham, the standard one and an alternative A2B offer, which is typically a reduction of up to two A level grades – for example, BBB rather than AAB. Students then complete a learning module designed to them up to speed with university-style learning, including assessed essay, online course and a student shadowing experience to get them used to the style of teaching they can expect. “It’s important that we work with partner schools and colleges to show students that the university of accessible,” said Mrs Rothnie. The outreach team also organise campus visits with local schools, student mentoring, residential visits and also work with teachers and advisors to help students make the transition to higher education. “It is hugely important that students make informed choices,” added Mrs Rothnie. AC Academy; COMP comprehensive; IND independent school (includes independent sixth form colleges); SFC Sixth form college; GFE general further education college. Table showing university placements from Staffordshire schools. Table showing university placements from Wolverhampton schools. COMP comprehensive; IND independent school (includes independent sixth form colleges); SEL selective (grammar school) GFE general further education college. Table showing university placements from Walsall schools. AC Academy; COMP comprehensive; SEL selective (grammar school) GFE general further education college. AC Academy; COMP comprehensive; SFC Sixth form college; TC tertiary college GFE general further education college. COMP comprehensive; IND independent school (includes independent sixth form colleges); SFC Sixth form college; GFE general further education college. COMP comprehensive; IND independent school (includes independent sixth form colleges); SFC Sixth form college.